This global view of Mars was created in October 2017. Credit: ESA / DLR / FU Berlin, CC BY-SA 3.0 IGO. Two June 2018 will mark 15 years since the launch of the European Mars Express spacecraft. Still in orbit around the Red Planet, Mars Express is one of the most successful space missions to be sent to Earth's planetary neighbour. One of the instruments still in operation is the German High Resolution Stereo Camera (HRSC). Operated by the German Aerospace Center (Deutsches Zentrum für Luft- und Raumfahrt; DLR), the stereo camera system captured a spectacular, global view of Mars in October 2017, revealing the beauty of the once very volcanically active planet. Members of the Department of Planetary Sciences and Remote Sensing at the Free University of Berlin (FU Berlin) produced the images shown here. The data was processed at the DLR Institute of Planetary Research in Berlin-Adlershof. What makes this colour image of Mars so special is that it shows a global view of the planet. The view moves south (upwards) from the northern lowlands to the Tharsis highlands. The image is one of over 1000 images and videos published by ESA, DLR and FU Berlin since the start of the Mars Express mission. 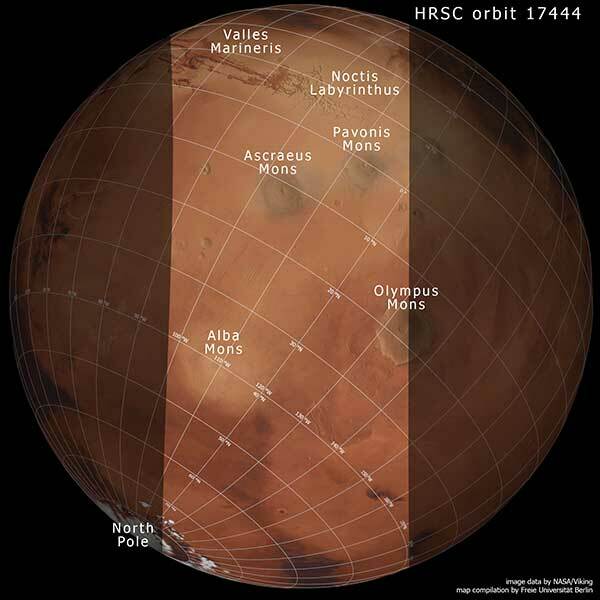 The HRSC instrument has done a great deal over the last 15 years to reveal Mars. Even now, after almost 18,000 Martian orbits, the camera reliably sends data to Earth that enriches scientist’s knowledge of the Red Planet. Since the NASA Mariner 9 mission in 1971, scientists have known that water must once have flowed across Mars, as evidenced by the now dry and dusty valleys. It was therefore among the most important scientific objectives of Mars Express and the HRSC experiment to decipher the climate history of Mars – where did all the water go? What caused the dramatic climate change between 3.5 and four billion years ago? It is striking that both the structure of the valleys and the mineralogy of the rocks that once came into contact with water have changed substantially. Until approximately 3.8 billion years ago, the planet had dendritic valley systems indicative of surface drainage similar to Earth, as well as a water cycle with precipitation. In more recent times, they have developed into long, wide, almost straight valleys resembling canals that suggest underground sources of water and a more episodic – but very violent – activity. View of the northern lowlands (bottom of image) and the highlands of Tharsis to the south. The wide field of view of the image allows a rare view of several large Martian volcanoes in the volcanic province of Tharsis. Credit: ESA / DLR / FU Berlin, CC BY-SA 3.0 IGO. In addition, the French spectrometer OMEGA on Mars Express discovered that this change also caused an alteration in the mineralogy. Older deposits contain hydrous clay minerals that are typical of volcanic rocks ageing in the presence of water. In contrast, hydrous salts like gypsum, a calcium sulphate, or kieserite, a magnesium sulphate, are present in more recent sediments. This indicates that the watery environment became significantly more acidic and therefore hostile to life (which is an important factor in considerations of whether and when Mars could harbour life). The reasons for this change are not yet known. Some scientists propose that during this period of 'climate change', Mars also lost its weak magnetic field, exposing the atmosphere to the solar wind, ultraviolet radiation and cosmic rays, and causing its pronounced depletion. Shown in this global view, the Tharsis region is among the geologically most interesting and well-researched areas of Mars. The HRSC image runs from northwest to the southeast across the Tharsis region – from the polar ice cap in the lower-left corner of the image, over the giant volcano Alba Mons, part of Olympus Mons, the Tharsis volcanoes Ascraeus Mons and Pavonis Mons – shown as dark patches above the cloud cover – and finally across the net-like Noctis Labyrinthus and the valley system of Valles Marineris, with its characteristic dark-coloured deposits in the top left-hand corner of the image. The light-blue, atmospheric haze is known as the 'limb' or the planetary boundary (the visible border between the planet and space), which is located close to the equator. Tharsis is a formerly volcanically and tectonically active region situated close to the Martian equator. It extends over much of the western hemisphere and contains most of Mars' volcanoes. The region forms a 'bulge' on the Martian highlands with an elevation of almost five kilometres, rising 10 kilometres above the planet's 'reference elevation'. As there is no sea level on Mars, the reference elevation is an equipotential surface that is defined by a specified atmospheric pressure. Several volcanic centres are responsible for the volcanic activity in Tharsis, of which the oldest is located in the Thaumasia region of the southern highlands (visible in the top right-hand corner of the image). Other, more recently active volcanic centres are found in Syria Planum, near Pavonis Mons, and in the vicinity of Alba Mons. A large number of what are known as 'volcanic dike swarms' that are arranged in circles or in the shape of stars in the Tharsis region can be traced back to these various volcanic centres. The development of several volcanic centres in Tharsis would only have been possible with a sustained supply of magma, possibly from one or more mantle plumes that would have changed location over time. Mantle plumes are mushroom-shaped bodies of rock at an elevated temperature within the viscoplastic mantle of Mars. They have a lower density than their surroundings and hence rise up to the outermost layer of the planet, the lithosphere. These kinds of hot, rising mantle plumes can produce intrusions, magma chambers and large igneous provinces. The valley system of Valles Marineris is visible at the top left-hand side of the image. Its origin and development is strongly associated with the volcanic province of Tharsis. Stress related to the creation of the Tharsis bulge resulted in crust elongation fractures. 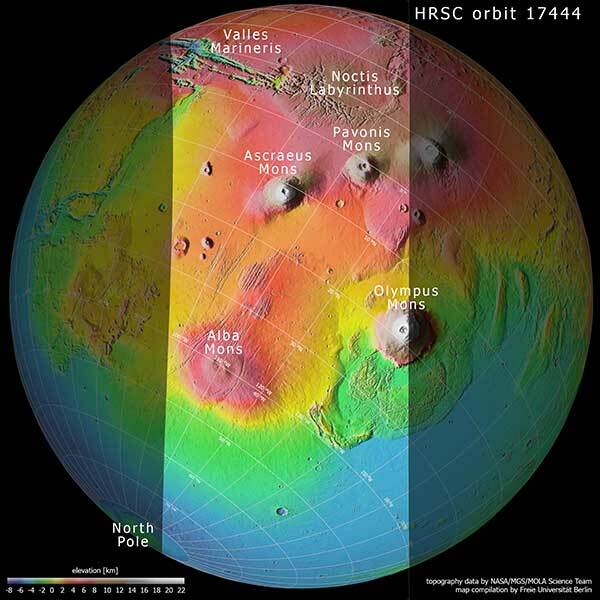 Extent of the area imaged by HRSC during orbit 17,444 depicted on a global view of Mars. The surface elevations are colour-coded. High-altitude areas are orange and reddish, lower areas are blue and green. Credit: NASA / MGS / MOLA Science Team, FU Berlin. Extent of the area imaged by HRSC during orbit 17,444 plotted on a global view of Mars acquired by one of the Viking spacecraft. Credit: NASA/Viking, FU Berlin. The images were acquired by the High Resolution Stereo Camera (HRSC) on 12 October 2017 during Mars Express orbit 17,444. The ground resolution in the centre of the images is approximately one kilometre per pixel and the images are centred at 245 degrees east and 25 degrees north. The colour image was created using data from the nadir channel, the field of view which is aligned perpendicular to the surface of Mars, and the colour channels of the HRSC. The context maps are based on data from the Viking missions and the Mars Orbiter Laser Altimeter (MOLA) experiment on board NASA's Mars Global Surveyor (MGS) spacecraft. The High Resolution Stereo Camera was developed at the German Aerospace Center (Deutsches Zentrum für Luft- und Raumfahrt; DLR) and built in collaboration with partners in industry (EADS Astrium, Lewicki Microelectronic GmbH and Jena-Optronik GmbH). The science team, which is headed by Principal Investigator (PI) Ralf Jaumann, consists of over 52 co-investigators from 34 institutions and 11 countries. The camera is operated by the DLR Institute of Planetary Research in Berlin-Adlershof.